The Egan House. Photo by Omar Willey. Licensed under a Creative Commons CC-BY-SA license. People who come to Seattle love to tear things down. This is not merely metaphor. Anyone who has lived in Seattle has seen the land grabs and razings of Capitol Hill, the Central District, Rainier Valley, and Ballard since 2001. Many get upset about these things in the abstract but tend to look the other way provided that no one tears down their own neighborhood cafe, grocery, hideaway or home. Because the city sharply divides along neighborhood lines, very little solidarity exists across those boundaries to preserve buildings that are important for more reasons than personal taste. Too, because so many of the city’s denizens were not born in the city and show little interest in it as a social and political entity, they have neither knowledge nor interest of the history of all those buildings that go up against the wrecking ball of out-of-town developers. Today’s object lesson in such ignorance is the Egan House. Hundreds of thousands of people drive past it five days a week. Very few of them have the faintest idea what it is. If they notice anything while they sit in traffic at the Roanoke Street interchange or the Mercer Street exit, it is a huge cathedral at the top of a hill, a bunch of green space below it and, if the light and angle are just right, some weirdly shaped house at its foot. That house is one of the most striking examples of modernist architecture–indeed any architecture–in the city. Built in 1959, Willard Egan’s retirement home cost him $10,762 at the time — a fairly large but reasonable sum. Located at 1500 Lakeview Boulevard East, just south of the incredibly steep Blaine Street stairs and just north of the Fairview overpass, the house nestles comfortably in the St. Mark’s Greenbelt. It is most remarkable not only for its unusual triangular shape but for its subtle relationship to its location and its owner. Admiral Egan was a retired Navy officer, so at the basis of architect Robert Reichert’s design is a supporting wooden structure that evokes a naval pier. The exceptional triangular shape of the house seems at first another exercise in modernist architecture’s fetish for Platonic solids, but in fact, the leading angle of the triangular form matches the grade of the hill where it resides: the slope of the wood matches the slope of the woods. Where much of modernist architecture sought to impose a rigid mechanical form upon the wildly unpredictable chaos of nature, the Egan House acknowledges subtly that the form itself is natural, that there is a harmony between the human and divine. Equally, from various angles, the overall shape of the house recalls that of an anchor–a symbolic reference to the house’s owner. Robert Reichert made at least three preliminary designs for the house before settling on its present form. 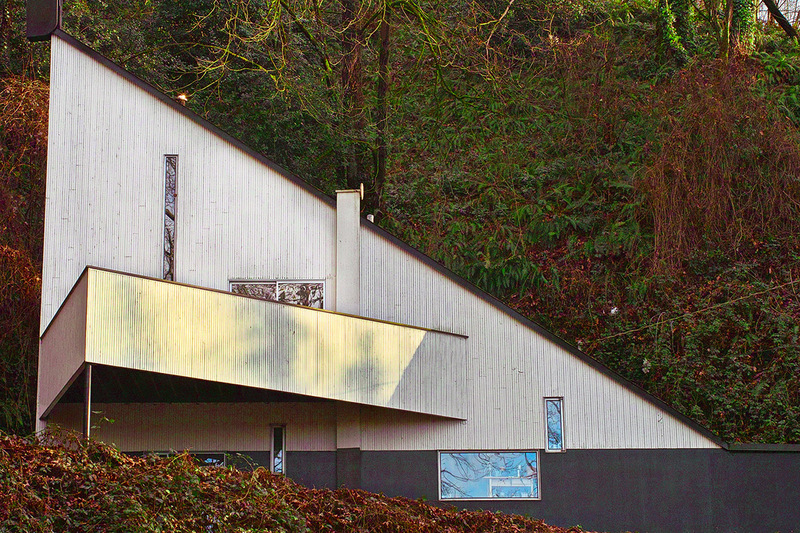 He designed it to last and uncontestably it remains one of the highlights of residential architecture in Seattle. After Admiral Egan, architect Dale Jorgensen owned the house until 1986, when it fell into the possession of Dillis W. Knapp. The first thing Knapp decided to do was cut holes in the building and build an ill-advised deck on the second floor. So much for architectural integrity. Even that, however, did not change the Egan House to be a suitably marketable property, and so in 1989 Knapp filed planes to demolish the house and replace it with a triplex. He would have gotten away with it, too, if it weren’t for his meddling architect. What he proposed instead was a modernization of the building. Hummel wished to regrade the steep entry walk and inaccessible driveway, add a new garage to the structure, remove the unwanted deck, and various other items. His proposal impressed Knapp sufficiently to green light the project, but at the last minute he balked and shortly thereafter sold the house to Nancy Harriss, who also found it undesirable and within the year sold it to Thomas and Kate Meadowcroft. The Meadowcrofts stayed less than a year as well, selling the property to Gary Ernsdorff for $177,000–a far cry from the house’s original value of $10,762. But the threat to the Egan House was far from over. Throughout this revolving door sequence of owners, the City of Seattle decided that something had to be done about the shrinking green space in the city. In 1993 the City of Seattle had adopted their “Green Space Policy” to preserve such space around the city, and the greenbelt in which the Egan House sat was a prime target. The city acquired the St. Mark’s Greenbelt and the six-acre parcel of hillside and flat that included the plat of land on which the Egan House had been built. Interested only in the green, so to speak, the city proposed to level the building and return the hillside to nature. At times when Seattle is about to do something truly stupid with one of its landmarks, a Steinbrueck usually steps forth. With the Pike Place Market it was Victor Steinbrueck; with the Egan House it was Peter Steinbrueck. Councilmember Steinbrueck reminded the rest of the council that this was in fact the Egan House, one of the most renowned and unique buildings in the city. Acknowledging that, Mr. Steinbrueck suggested that the brutally neglected house would benefit more from being restored than from being destroyed and in one of our city council’s few sensible moments over the years, enough of them concurred. The city’s Landmark Preservation Ordinance cites threshold requirements that a potential landmark must meet. A property must “have significant character, interest or value, as part of the development, heritage or cultural characteristics of the City, State or Nation.” This suggests that a building must be valued at the citywide level–always a problem in a city where no one has the faintest idea what exists even in their own neighborhoods. Nevertheless, somehow the Egan House was approved as just such a thing, and in 2001, the Historic Seattle PDA took over stewardship of the building. Hiring architect Lee Stanton, they proceeded to upgrade the electrical, heating, and plumbing systems, and to add some more modern amenities that remained consistent with Robert Reichert’s original vision. completed in 2003. The roof was replaced, using the original shingle design, and the Egan House painted with the colors suggested in Reichert’s original plan: black, white and red. This work was not trivial. The house had been neglected by its owners and further beleaguered by the elements. The total cost to repair the house ran $102,000. But that’s what public money is for: to restore to the public things it would otherwise lose to the elements or to greed. For each taxpayer to chip in roughly sixty cents a person to preserve one of the most definitive buildings in the entire state is a small price to pay. In 2003 the Egan House restoration was completed. Since then, the Parks and Recreation department watches over it judiciously and leases it out as a private residence to some very fortunate persons. Most probably have no idea how the house had to weather the onslaught of the ever-present elements of Seattle, water, greed, and human stupidity. They probably have no idea exactly how blessed they are. In that sense, they are truly denizens of Seattle: blessed beyond their knowledge to live in this magnificent city, while completely clueless of its history and beauty.